Spring is in the air! It’s time to shake the remnants of winter off the ol’ Uggs and turn your thoughts towards the latest trends in fashion . 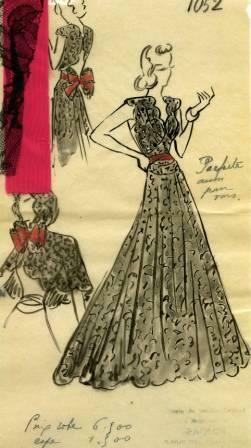 . . or at least the latest trends in fashion from the 1930s-1940s. 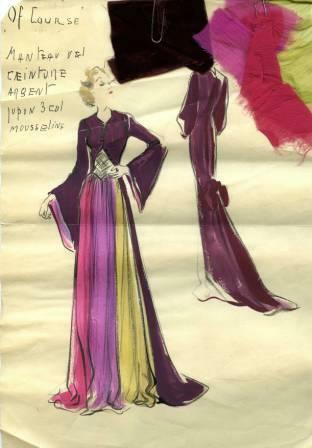 We recently found 40 hand-drawn, hand-colored dress designs by Maison Paquin, a Paris fashion house known for its evening dresses and tailored day dresses, in the Doris Duke Charitable Foundation Historical Archives (featured in our recent exhibit). 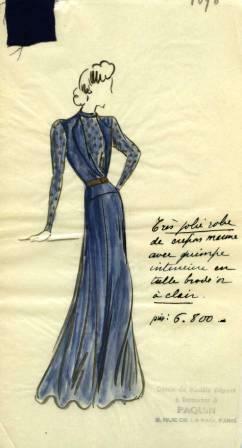 Jeanne Paquin (1869-1936), a French fashion designer, was known for deep, rich colors, luxurious fabrics, and modern and innovative designs. She tended to use materials that hugged the body on top and flowed on the bottom. We don’t know if Paquin designed these dresses specifically for Doris Duke, but, considering there is a patron number and specific fabrics attached to the designs, it is highly likely that these were designs only available to serious couture customers. 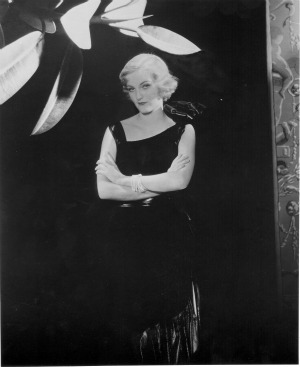 A further clue into Doris Duke’s patronage is a receipt from 1938 in which she purchased 26 items from Paquin for 81.650 francs. Looking through (and ooh-ing and aah-ing over) all these amazing designs made us wonder how they would have stacked up in a show like Project Runway. We have narrowed down the 40 Paquin designs to 10, and will be showcasing them here on The Devil’s Tale in two runway challenges. Today’s runway show is evening wear. Click below to see the designs and vote for your favorite look. You get to decide which is in and which is out! The simple palette of black and white never goes out of style. White lace combined with the geometric patterns trimmed in black offers an intriguing contrast of femininity and modernity. This dress is ideal for daytime art exhibitions or impromptu concerts in the City of Lights. Whether sitting around the estate heating up last night’s duck à l’orange or attending a fancy soirée, this dress is “parfait pour vous.” Perhaps inspired by Little Red Riding Hood, this look will leave the big bad wolves breathless. A stylish blend of drama and theatricality, this gown is not for the faint of heart. Make an entrance they will never forget and discretely stow your leftovers after a lavish seven-course meal, because a true lady never asks for a doggie bag. Who says you have to bare it all to attract that certain someone? This elegant sapphire ensemble is subtle in all the right places to reveal a woman’s inner confidence and good fashion sense. It’s prom night. Who are you going to choose, Blane or Duckie? Bow-l them over with this ethereal, lacy, pink gown and rule the night . . . and their hearts. Stop back next Friday for our day dresses challenge. Auf Wiedersehen! Post contributed by Mary Samouelian, Doris Duke Collection Archivist, and Molly Bragg, University Archives Drill Intern. Thanks to Tom Crichlow for his technical wizardry! What a wonderful little archive, please if you have more share, it is sad to think how much is hidden away in archives and never seen. Thanks for sharing. Ooooooh, I don’t know, Betty. A lot of us are torn between that one and “Sophisticated Lady”! Doris had a lot of fun choices! Thanks for reading, and please stop back soon. Looking for that white dress Ms.doris day wore in one of her movies. It was white,long,,the part at waist came off to show long slim;split in back. The back was out. Thanks for your comment! 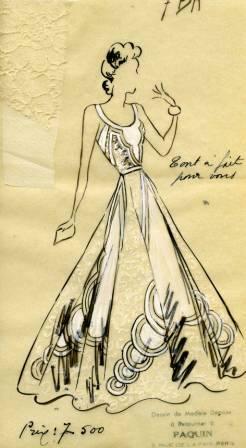 I’m not sure that we’d have documentation on this particular dress of Doris Day’s, but I wonder if the Copley Center for the Study of Costume Design might be able to help. Best of luck on your search! What an awesome dress design! I love most the pink gown dress. 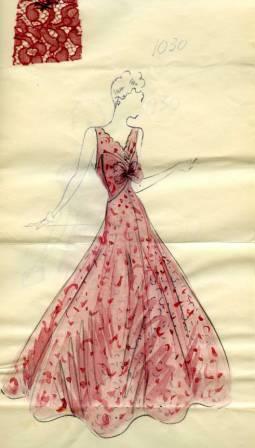 I wish I could wear this cute gown. By the by, thanks for sharing. I love these type of dresses. thank you for sharing !